Tra Vinh (VNA) – The Mekong Delta province of Tra Vinh is making a beeline for sustainable poverty reduction, aiming to cut the rate of impoverished households in the locality by 2.5 percent by the end of this year. Developing infrastructure in special disadvantaged communes, supporting accommodations and fresh water for ethnic households as well as helping deprived families branch out production and improve livelihoods are among its efforts to realise the set target. 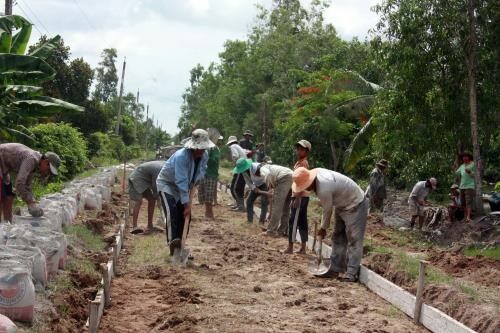 Director of the provincial Department of Labour, Invalids and Social Affairs Nguyen Van Ut said that the province is splashing out over 7.4 billion VND (325,600 USD) on infrastructure development in seven poor coastal communes and 1.9 billion VND (83,600 USD) on production models. Another amount of 47 billion VND (2.06 million USD) is being disbursed to provide accommodations for 1,880 poor households, he added. Between now and the year-end, the department will work with local chapter of the Vietnam Bank for Social Policies to provide loans of 4.4 billion VND (193,600 USD) for poor labourers to work abroad. To date, the bank has disbursed over 186 billion VND (8.2 million USD) to help nearly 11,000 poor and near poor households and those escaping from poverty develop production. In addition, poor families in the province have been assisted to pay electricity bills, health insurance and tuition fees.